It's no secret that teams have been coached to force Denard to hand the ball off on the zone read. But despite Michigan's numbers advantage after the handoff, the running backs have only been gaining minimal yardage and occasionally tackled by the defensive end that was keeping contain on Denard. Part of the reason that the backs were having so much trouble is that just before Denard hands the ball off, the defensive ends are already starting to attack the running backs. Against Penn State, Denard broke out some freaky Juice Williams play fakes on the zone read, where he held the ball long enough to catch the defensive ends cheating like this. Denard's ability to execute this frequently will be key to keeping defenses honest and opening up running lanes for the halfbacks. 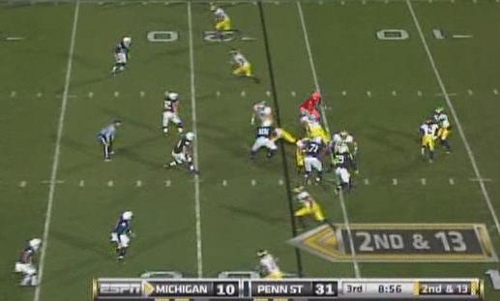 One such instance was on a 2nd and 13 in the third quarter following a clipping penalty that set Michigan back. There's nothing special about this alignment. Michigan is in an four-wide ace set with Vincent Smith in the backfield. Penn State showed this defensive front a lot during this game, and I believe that it's a 4-2-5, but without more closely analyzing their defensive personnel, it may just be a variation of their base 4-3. But for the sake of argument, we'll call this a 4-2-5. 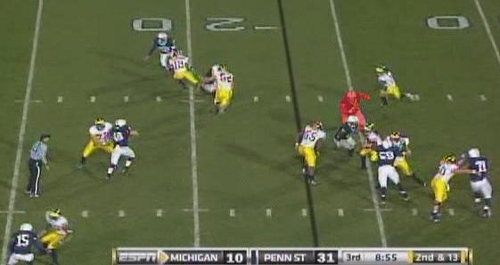 On the snap, Michigan leaves the playside defensive end (red) unblocked. Steve Schilling is pulling across the formation to the playside of the play and will be responsible for the playside linebacker. Denard is reading the defensive end. 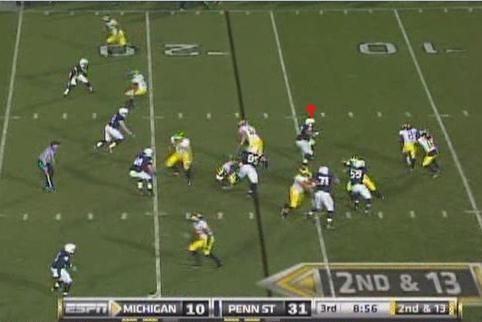 Denard is still reading the defensive end who is showing contain, signaling that Denard should hand the ball off. Schilling has pulled across the formation and is getting to the second level to block the playside linebacker. This is the moment where Denard really sells the fake. 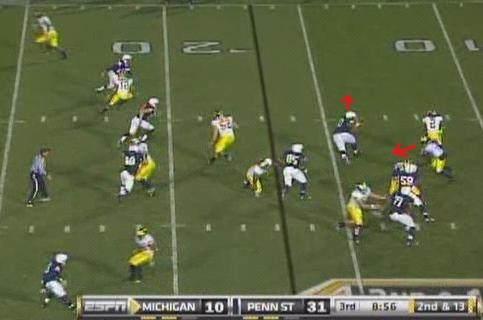 Smith is now beyond Denard but they are still engaged; Denard can still keep or hand the ball off. The defensive end begins to move with Smith because he thinks that Denard is handing the ball off, but he's held it long enough to see which way the defensive end is going to commit. Now the defensive end has completely committed to the Smith run, as has one of the Penn State defensive tackles who Patrick Omameh has completely whiffed on. Despite the missed block, Denard is still able to skirt ahead through the gap because the defensive tackle was sold on the play fake. 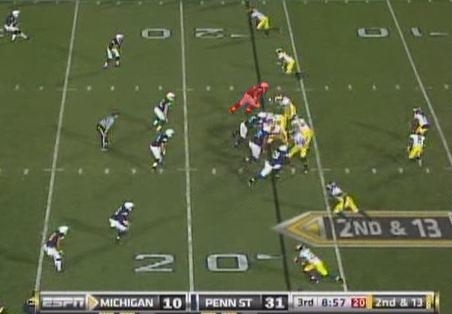 Penn State's playside linebacker and nickelback are also crashing on the Smith run, opening up the field for Denard. The defensive end (red) who had been keeping contain on Denard is now three yards away from him laterally with no shot of catching him. Denard was able to make sure he committed to Smith before pulling the ball. The defensive tackle that Omameh missed is also diving backward to try and tackle Denard after he bit on the play fake. With good blocks down the field, Denard is able to pick up the first down and more. I think a lot of people have been especially negative on the running backs this year when they've been pretty functional, at least on par with the production of the receivers. But despite teams nominally forcing Denard to hand the ball off on the zone read, they've still been cheating and finding a way to get to the running backs by reading Denard's play fake. Michigan has seen opponents try a couple of different things like this to contain the hand off. Notre Dame blitzed their linebackers to plug the holes at the offensive line in order to give the weakside defensive end enough time to come down the line and make the tackle on the halfback. 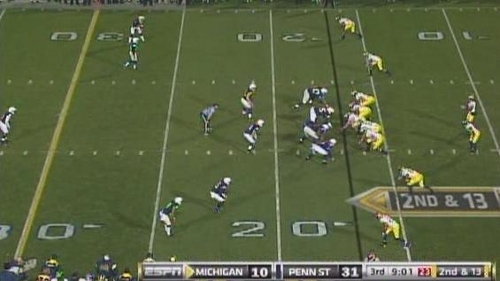 But Michigan was able to counter this by using the play-action seam route that has become a staple of the offense. In this case, and presumably going forward, Denard's play fakes are going to take longer and force the defensive ends to truly make a commitment to either the running back or quarterback, opening up lanes for both players. Denard's ball fakes were outstanding for the most part in the game. There was a play out of the 2 back with Shaw and Smith that I think might have been a veer where he stayed in the mesh forever. The play failed due to problems with the blocking up front but these were very positive signs for our effectiveness going forward.